The business category utilizes a maximum of iOS apps because of the numerous advantages that help them to grow and reach a targeted audience. Its further estimated that iOS apps improve the ROI of a business as well as maintains a high standard app quality. Well, when we talk about programming language iOS Application Development use Swift or Object-C. 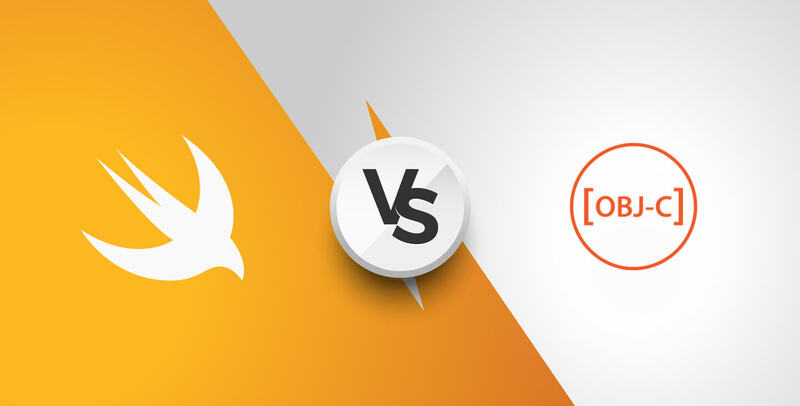 In this blog, let's explore the overall view about these two programming languages and which best suits the development process. Know to be a long-standing programming language - Objective-C has been spotted as an essential dialect in the realm of Mobile Application Development. Utilized widely to develop effective iOS and OS mobile applications, the language came into force in the 1980s and become the iOS app development standard for many years and well tested. The language is influenced with two programming language C and Smalltalk - that makes it complicated and verbose syntax. Object-C uses dynamic typing and message passing. It also requires diving classes into two code blocks: interface and implementation. ❏ The detailed lines of code written in Objective-C make provide standard quality to the app. The well-documented, third-party frameworks, provide solutions to every query. ❏ Offer great compatibility with C and C++, thus operating with C or C++ code works is relatively smooth. ❏ It’s stable, thus the application in Objective-C, do not involve migration expense to a new language version after a few months. ❏ It is hard to learn. Significantly, Objective-C is different from many other popular programming languages, and memory management is also very complicated. ❏ Less availability of developers as it is hard to learn. ❏ The app developed in Objective-C is hacking prone. ❏ Apps developed with Swift are safe, as the features – generics, options, and type interference – make the app bug-free and does not crash easily. ❏ Apple constantly improves this language to strengthen the community. ❏ According to a 2017 Stack Overflow Developers Survey, Swift - comes AS forefront of the most preferred programming languages. ❏ Migrations and changes - one of the weakest point in app development with Swift. However, improvement is already proposed after introducing ABI stability. The problem is due to the continuous changes executed in the language. Developers needed to migrate applications to the newest versions, which is costly and time taking. Swift is the more preferred option when the iOS mobile app development demands clarity of syntax. Further, the ease of code writing makes the development convenient for the developers even with the complex functionality. The swift allows limited code lines for similar action, this means less code compared to Objective-C. In swift, there exist no confusion or mess in method and function calls unlike in Objective-C. Thus, they look arranged with the help of the list of parameters elegantly separated by a comma, making the syntax simplified and clean in the result. The Objective-C dependency engages the programmer to support two code files to boost productivity and decrease build time. On the other hand, Swift is free from such interdependencies because it eliminates two-file requirement with a single code file (.swift) which combines the Objective-C header (.h) and implementation file (.m). Therefore, Swift is comparatively easier to maintain than Objective-C. Swift allows developers to avoid this annoyance that can be utilized in important aspects of programming including code quality, features, and app logic, etc. Swift language has less scope of error as it lets programmers manipulate text strings, however, Objective-C provokes issues that create errors or app crashes. Objective-C executes consolidating two strings lengthy and Swift approves combining two strings with ‘+’ sign. Security of an app is one of the most crucial aspect, not just a necessity, letting the emergence of a successful and assure remarkable user experience. Thus, security should be the first priority. And when it comes to iOS app development, swift language offers syntax that is free from common mistakes in comparison to Objective-C. Dynamic iOS Swift libraries are flexible and ensure app's update to the latest, emerged version of Swift language. The dynamic libraries are generally the executable codes and are placed instantly to the memory, optimizing the size and the app's performance. Such progressive updates ensure the applications developed with Swift are most updated and interestingly, the language supports updates quicker than the iOS platform. Being open source, Swift lets programmers utilize the full potential of the language with different platforms. The open-source also intimates that Apple will reduce the gap in the community of independent developers. This help in processing feedback to execute meaningful changes consistently. Thus, Swift as an open source phenomenon offers immeasurable opportunity to convert proposals into better actions and build evolved code architecture and mobile apps design. The choice between Swift and Objective-C rely on different factors like the app size, team strengths, technical awareness, and project deadline. To initiate a new iOS project development, the decision about which programming language to pick is quite crucial. Further, it will influence other choices, like architecture or used frameworks. Advancement in Swift is constantly executed with the futuristic vision, aims at rapid, safe, and appropriate development from a developer’s perspective. However, decisions dependent on specific context, Swift is great. Objective-C has its own perks, which can be the right choice.